Ok, so in between my posts on accessing consciousness I had to stop to pen (ok, type) this. I’ve been writing the next post on emotional freedom in which apart from mentioning my own technique I developed for managing emotions, I talk about EFT tapping (Emotional Freedom Technique). I was writing about how I had recently, finally, begun to use it, thanks to a great – and short – video introduction to EFT by Jack Canfield, but only in a limited way, to ease a chronic pain in my shoulder. In continuing the article I mentioned that because I had other personal growth goals I had not dedicated any time to this technique I have heard so much about, in particular the amazing results it produces. Since the series is about consciousness, I mentioned the problem of us not being aware of a lot of issues. The irony will not be lost on you that not long afterwards, while taking a break from writing to follow up on another project of mine, promoting my mum’s beautiful paintings, I suddenly froze at the idea of calling the company I’m using to produce greetings cards. There are people who might find this absurd, but I’m sure there are plenty who like me, have a real problem with talking on the phone. Now I have made significant progress on this since I’ve been earnestly working on self-development – or rather self-realisation, as Paul Scheele of Learning Strategies calls it in his powerful Abundance fo Life course* – and as I’ve eliminated negative and limiting beliefs, it has become easier. When I have issues, they are usually no more than the little fish slaps in Monty Python’s Fish Slapping Dance. But this hit me like the giant one John Cleese pulls out at the end! * Affiliate disclosure I am a longstanding customer of Learning Strategies and a big fan of Paul Scheele and his work. So I am now part of their affiliate programme and will get a small commission if you buy the course, at no extra cost to you. I thought “how can this be that I still have this morbid fear of calling”. Of course, then came the torrent of answers, or rather excuses: “you’ve already sent them two emails, they’re probably busy”, “I’m living in Spain and have to call through Skype – AND wifi! What if there’s a problem with the line?”…and so on. Wow. It was like all my old behaviours and fears coming back that I thought I’d conquered. Since my mum has an Open Studio event coming up in the first two weekends in June, it was urgent I at least found out if the quality of the new images I sent was adequate, and I had said I would call (well, I said “probably” – clearly a sub-conscious message from that fear, which emphasises the main thrust of my developing consciousness series). So I had to do something. In writing the next post on consciousness of our emotional state, I had re-watched Jack’s video and tried it on an old emotion/behaviour which I suspect is still sub-consciously holding me back, though less and less. So I tried it again, this time to conquer my fear of calling. 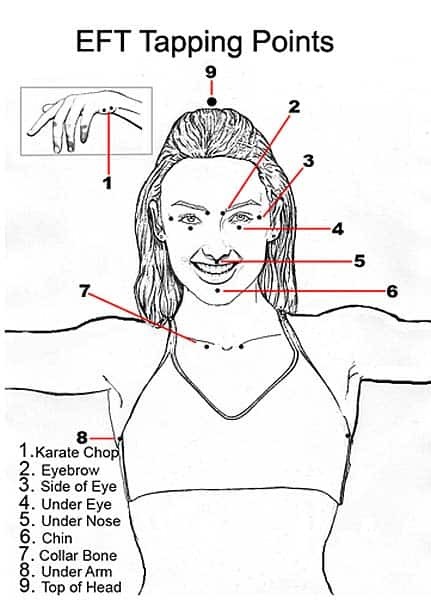 Repeat step 4 several times (5-10); I find I am slightly buzzing after that, with the energy moving through my body. You can then finish with a short meditation, where you visualise being surrounded by brilliant white light, which enters your body and physically dissolves the fear (works great with pain) and carries it away, out of the room. I must admit, I have a little trouble visualising the white light, but as long as you can imagine the fear dissolving and leaving you, that works. Now Jack is keen to stress that if it doesn’t work, keep practising and he promises it will. The goal is to reduce that score in step 2 to a 2 or 1 – or even better to eliminate it completely. I didn’t succeed the first time in eliminating it completely, but I picked up the phone and called, so it clearly worked to some extent! My mind felt free and clear to talk to the company and find out what I needed to know. I really did feel that I had begun to conquer my fear. So if you want to learn to conquer your fears, I invite you to give this a try – for 5 minutes it’s not a big investment of your time for the benefits it brings!